so remote from Black Friday. What then, your swan song? Beautiful! Don’t think I’ve ever seen one of these up-close. It looks like you’re right next to him/her, Sarah. Was s/he ‘friendly’? I’ve heard about geese not being so nice (especially if eggs/young are there). Yes, he was very tame and serene. He seemed to love posing for the camera. Swans can be exceedingly cranky. I heard of one breaking a boy’s leg when he was walking along a canal towpath. 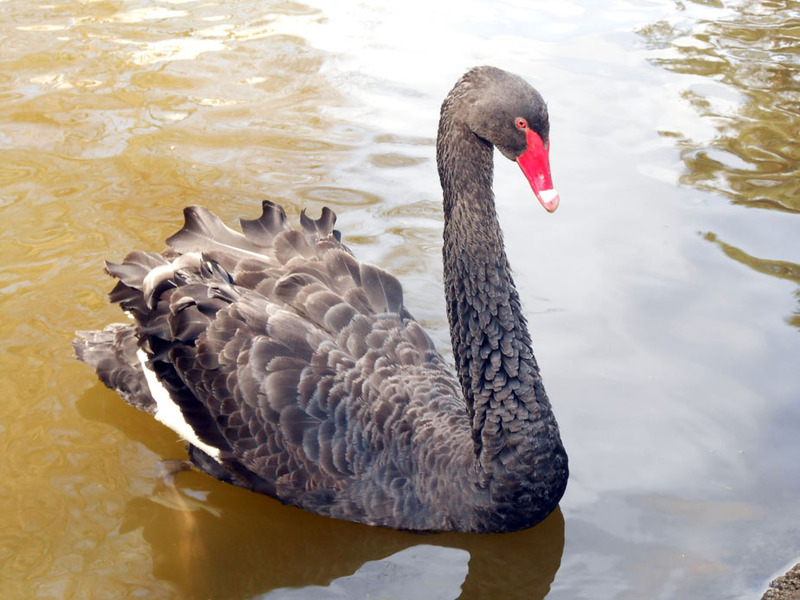 Maybe black swans are more peaceable than white ones. We need an ornithologist or amateur bird-spotter’s opinion here! Very clever about Black Friday. Perfect in its simplicity. Thank you, Billy. Sometimes I feel “in this world and not off it”. I couldn’t believe those pictures on the news of people on the ground fighting each other for bargains. It seems far removed from the eternal scheme of things, if there is a scheme, or maybe it’s all random, which would explain a lot! Very much better, Andrea, although I photographed this swan in the calmer month of May, but its quiet majesty came to mind amidst the chaos. Great inspiration here, Sarah. He’s beautiful. What an adorable shot! Love the haiku as well. Thanks, Jean:-) Do you have any black swans in Ireland? The swan in my picture was in someone’s private manor house that was open to the public. I’ve just read on someone else’s blog that there’s a pair of black swans there and one of them is rather nasty. I obviously met the good-tempered one. Maybe the nasty one is more like the people who resort to violence on Black Friday! I’ve never seen any here but I suspect there could well be some. I must check it out. I love this, Sarah! And yes, way better than shopping for “supposed” deals! A lot of them aren’t deals at all. What I’ve noticed is that a lot of retailers put up their prices a month ahead of Black Friday, in order to then slash those prices so that they seem like bargains! Do they think we’re born yesterday? Hubby purchased a radio for me a few weeks ago. This cost less (by at least £10) than the so-called Black Friday deals for exactly the same model. Indeed, I’m sure you’re unscathed this fine Tuesday after, as is your bank account! The only thing I’ve purchased in the last few days are two pairs of People Tree fair-traded organic cotton leggings (that I planned to buy anyway) and paid the full and usual price for them. And very pleased with them I am. One pair is black and the other is plum. Now I’ve got to decide what jumper in my wardrobe goes with plum leggings! Perhaps my olive-green jumper, then I’ll look like a plum tree. Ha ha! I’m sure that would be lovely!